Editor’s note: This is a chapter from Search Engine Journal’s new e-book, SEO 101: Learn the Basics of Search Engine Optimization. Want to read the full guide? 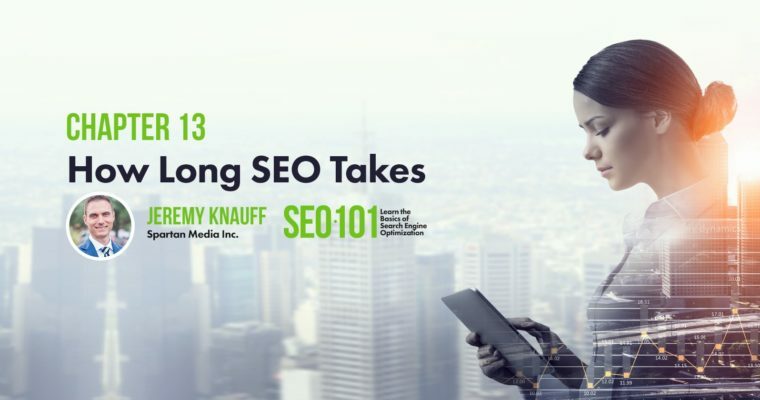 Download your copy of SEO 101 now! This is because, in addition to all of the variables that play a role in the optimization of your own website, you also have to evaluate those same variables in your competitors’ optimization efforts. This can make an already complex question infinitely more difficult to answer. Unfortunately, I won’t be giving you a specific timeframe for SEO results because that’s impossible. Nor will I be sharing some secret formula to answer this question because one simply doesn’t exist. However, there is a lot more to answering it than guesswork. The truth is that how long it takes comes down to analyzing several variables for your own website compared to the same variables for your competitors’ websites. There are three specific criteria that play a significant role on how long your SEO will take: competition, inbound links, and content. If you’re selling something like salmon-flavored toaster pastries, you probably won’t face any competition. However, those of us selling products and services that real people will actually buy are going to face varying degrees of competition based on demand. For example, a plumber serving a small local market would face less competition than a real estate brokerage in the same city, which would face less competition than a national mortgage company. As you might imagine, the more competing webpages you’re up against, the longer it will take to get results. Both the difficulty and time necessary will usually follow a bell curve, in that the webpages ranked lower will be easier to outrank, and it will become progressively more difficult and take longer to outrank the webpages the closer you get to the first page. There’s another important and often overlooked aspect of competition that most people don’t even realize, and it’s the correlation between the volume of competition within a niche, and the competency of the SEO professionals behind the top ranked webpages in that niche. Demand drives companies into a niche, leading to increased competition. That competition pushes them to offer more competitive deals, which means they must take a larger share of the market in order to remain profitable. This is an environment that usually favors larger companies with deeper pockets — and they can afford to hire the best SEO professionals in the industry. If you’re up against this situation, you’ve got a longer and tougher battle ahead of you. It’s no secret that links still play a huge role in SEO, but their impact on how long it takes depends on several deeper factors. The first is the volume of links to your website. Generally, more links will help you achieve SEO success more quickly, but it’s not just a numbers game. A plethora of links from low-quality websites not only won’t help your ranking — they could actually hurt it, slowing down your progress. Instead, you need to focus on quality links from relevant websites. Finally, both the speed at which you earn links and the speed at which you have historically earned links, are also factors because, generally, an abrupt increase indicates an unnatural attempt to manipulate ranking. So, generally, the faster you can earn relevant, high-quality links, the faster you will rank, but that comes with a caveat. Your link velocity — the speed at which you earn links — should have relatively stable growth. If your link building tactics follow Google’s guidelines, that should happen naturally. It’s usually only when you use black hat tactics that you see unnatural patterns that could slow down your progress. The content published on your website also plays a role in how quickly you see results, and the first thing you need to know is that quality matters a lot. Fortunately, the days of churning out hundreds of 300-word articles you ordered on Fiverr isn’t going to move the needle when it comes to your ranking. Now, don’t interpret this to mean that each piece of content you publish needs to be a 4,000-word beast. In fact, there is no minimum or even ideal length — content simply needs to be long enough to solve a visitor’s problem. There is a myth that you should publish new content slowly, which comes from the theory that publishing lots of new content at once could look unnatural to Google, and thus, could hurt your ranking. It’s understandable how people could believe this myth, but it’s been officially debunked by Google. If you have great content ready to go, then there is no reason from an SEO perspective not to publish it immediately. The sooner you get it out there, the sooner it will have a positive impact on your ranking. Waiting only makes your SEO take longer. It’s worth noting that the ranking of a webpage does correlate with its age. In other words, newer pages tend not to rank as well as older pages, but that is due to other factors, not the age. It shows Google that new content is added to your website on a regular basis, which generally encourages their spiders to crawl it more frequently. This helps to speed up your SEO efforts. It encourages users to return to your website more frequently, which may help send positive user experience signals to Google, and as a result, further speed up your SEO efforts. So, Is It All Just an Educated Guess? Our job is a lot like that of meteorologists, where despite all of our knowledge, experience, and tools, we often get things wrong. And much like my local weatherman, whom I want to choke until he turns blue when my beach plans are ruined by the rain that he promised wasn’t going to happen, our clients are often just as frustrated when they don’t see results from their SEO campaign as quickly as they would like. Part of the job of an SEO professional is to manage client expectations. This is an area that many fail in. Thanks to being told what they wanted to hear by far too many practitioners, many clients today have unrealistic expectations. As a result, many people think this is something that only takes a few weeks or even months. You might begin seeing improvements in organic ranking and an increase in traffic for keyword topics with little competition in just a few weeks. On the other hand, moderately competitive topics might takes months, while highly competitive phrases could even take one year or more! For example, my team was able to rank a website #1 for the term “marketing company”, which produced a steady flow of leads for several years. However, despite our skills, manpower, and resources, it took us about a year of consistent work to achieve that. On the other hand, a particular client with virtually no digital presence came to us when a website had published some unflattering information about him that was taken completely out of context. Since it held the first position in Google for his own name, this had cost him a considerable amount of business. Fortunately, there was little competition for his own name, and that website didn’t have much authority, so we were able to fill the first several pages in the search results with pages we controlled in just a few weeks. I’ve also seen cases when clients and even agencies have used tactics that violate Google’s Webmaster Guidelines in an attempt to speed up the process. While this may work in the short term, you will eventually face a penalty and end up further behind where you started. You need to be prepared to invest several months to a year before seeing results from your SEO efforts, but even then, you won’t be king of the hill. In fact, according to a comprehensive statistical analysis by Tim Soulo, only 5.7 percent of all newly published pages will get to Google’s top 10 within a year. You can’t accurately predict exactly when you’ll achieve top ranking for a particular keyword or topic. However, you can make a highly educated guess based on certain variables. Over time, you can get a better idea of how long it may take within your particular niche.